The Pinata climbing rose is really quite a stunning climbing rose that provides an unusual assortment of colorful blooms. While not an overly tall climber by rose standards, what this little gem lacks in height it will more than make up for in beauty. The blooms will start appearing near the end of spring and will continue on for the entire growing season. Various shades of pink, gold, oranges, and reds will be constantly changing as new blooms appear, giving you a veritable rainbow of colors. Climbing Pinata roses are very small and compact as climbers go, so many gardeners mistake it for a normal shrub rose when it is not. This little rose is unique in a number of ways from other climbing roses in that the canes this plant grows will be thick and very rigid which makes this particular variety difficult to train. This is not a good selection if you would like your rose to grow along a fence line, or other horizontal support. It will do just fine however with a trellis or an arbor. Choosing a location to grow your Pinata climbing roses is actually a treat compared to some other varieties as you will find the Pinata is quite forgiving on where it will grow. You will see a lot of companies that sell this rose say it is tolerant of shade. A more accurate description is that it prefers a location that gets partial shade during the day. Like most roses, the Pinata loves a location where it gets that morning sun, but you will find its blooms will hold onto their color longer if the plant is shaded during those hot afternoons. 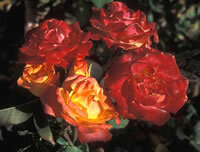 Like most other roses, climbing Pinata roses absolutely need to be grown in soil that is well drained. If your soil is hard and compacted, or if the location you have tends to stay wet for long periods of time, these are not great options for the Pinata rose. While soggy locations tend to be difficult to correct, especially if they are low-lying areas where water collects, hard and compacted soil is actually rather easy to amend so that it is agreeable with growing roses. Planting your Pinata climbing roses is much the same as planting any other rose. The first thing you need to do is prepare the soil so that you give the rose the best growing conditions possible. If you look around for advice on soil mixes, you are going to find a wide range of ideas, and each one is a little different and specific to the growers themselves. By and large though they are all pretty similar. Assuming you have somewhat normal soil, a good starting point for growing roses is to have 33% soil, 33% perlite, and 33% compost. These are not scientific measurements by any means, just a good rule of thumb that I've used with great success in a number of gardens. Not surprisingly that same mixture works well for flowers and vegetables too! Once you have the soil ready, dig yourself a hole that is a few inches larger than the root system of the rose, making sure to leave a mound in the center of the hole's bottom. Do not dig it flat. When you plant the rose, set the base of the root system on the mound and then spread out the roots all the way around, making sure the plant is not sitting on any of them. Once your climbing Pinata roses are in place, gently fill the hole halfway with the soil you dug out, but do not tamp down. Instead, use a garden hose to thoroughly soak the soil which will cause it to run down around the roots. Then fill the remainder of the hole and soak again. You will have to repeat this process a few times before the hole is filled. 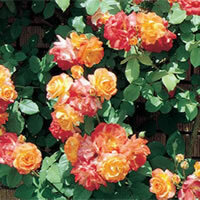 Growing your climbing Pinata roses is not much different than other roses. You will need to make sure you keep them on a regular watering schedule. A good rule of thumb is to give your roses one good watering every week. If your climate is especially hot and arid, you will probably need to move that up to every 4 to 5 days. You just need to make sure that you are not overwatering your roses as this will be an invitation for diseases and pests. It is also a good idea to try and avoid watering your roses from the top down. This can lead to the leaves staying unusually wet and can also lead to problems down the line. 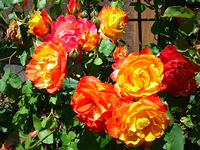 If you would like to keep your climbing Pinata roses blooming all season long, you will need to stay diligent with deadheading them, and you should consider putting your roses on a feeding schedule. Most roses will do just fine if you give them a feeding in early Spring, as the leaves begin to form. 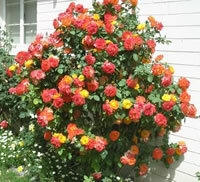 Many growers will feed their roses two more times throughout the growing season. The second feeding can be given just as the first big bloom begins to form, and the third feeding at least one month later, sometime around mid-July. There are a number of products available on the market for feeding roses, however you should try and stay away from the liquid chemical fertilizers as I have found those frequently burn many varieties of roses. If you pick up a general, all-purpose granular fertilizer, you will do just fine. Just be sure to follow the instructions on the product and as I said, make sure you leave at least one month in between feedings so you don't over do it.